Tall Emu’s quotations system is built in, and uses the product list from one of the supported accounting systems if required. Out of the box we’re able to quote on a variety of products, using a fully detailed quote screen showing costs, gross profit margins (and amounts) or a simple fast-entry grid which is common in desktop accounting systems. The generated quotes can be emailed as PDF, printed, automatically followed up – and all of this is logged against the quote record as well as the customer record for maximum visibility. 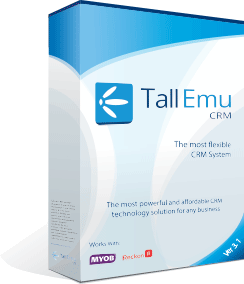 However, some of the real power comes when we configure Tall Emu CRM to generate quotes unique to your business. The powerful product capabilities come into their own – but it is also possible to add in custom fields and calculations.